It can become daunting for graduates when faced with the realization that they now need to start their career. 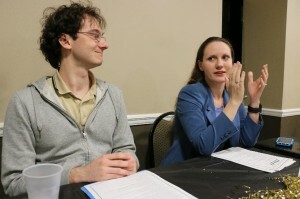 Bethany and Nick, understanding that they were talking mostly to college undergraduates, created the seminar to lessen the stress a new-hire might have. Bethany and Nick incorporated their own personal experiences from Wyndham and Lockheed Martin, respectively—two astoundingly different companies—to create a guide to the world of starting in a technical communication job. Conducted in an informal discussion style, this table progression revealed twelve key components encompassing what to expect, what to know, and what one needs to succeed. The discussion style also worked as a method for everyone to treat the seminar as a quick mentoring session between peers and professionals. Topics ranged from finding “your niche in your team” and taking pride in your own victories to honing your email skills. The assurance that “most people do not look down on us, believe it or not” eased the minds of those who visited the table, especially when reminded that “your perspective is valuable,” a notion that recent graduates often don’t realize as they enter the workplace for the first time. Nick Ducharme and Bethany Aguad, both in their first year as technical communication professionals, guide soon-to-be graduates on the rites of passage. This entry was posted in All Archived Volumes, Volume 2016-03 by Nicholas Ducharme. Bookmark the permalink.